Please RSVP by April 13 to Sophia Hiltner by telephone (216.577.7447) or by email (sf.hiltner@gmail.com). You are cordially invited to experience an extraordinary piece of theater and music by Viktor Ullmann during our event on Wednesday, April 17, at the Louis K. Meisel Gallery in SoHo. The melodrama The Tale of the Love and Death of Cornet Christopher Rilke for Narrator and Piano will make its New York premiere, and two Pianofest alumni will perform during the event. The score is a translation and adaptation by John Fink. The rarely performed piece was one of the last for Jewish composer Viktor Ullmann, who wrote it while forced to be at the Nazi concentration camp Theresienstadt. It is based on poems by the German poet Rainer Maria Rilke, who gained much success from this particular poem. 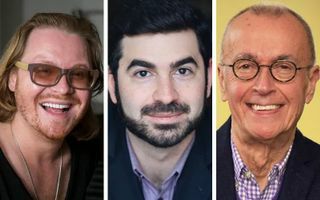 Pianofest alumnus and Artist-in-Residence Konstantin Soukhovetski will perform Ullmann, and D. Terry Williams, professor emeritus of theatre at Western Michigan University, will narrate the piece. Also on the program, Pianofest alumnus Michael Brown will perform music by Leonard Bernstein and Aaron Copland, including the West Side Story Suite (arr. Leo Smit) and El Salón México (arr. Leonard Bernstein). The concert is set in the beautiful Louis K. Meisel Gallery, which exhibits new paintings by many of the original Photorealist artists as well as the younger generation of realist painters and sculptors. The event occurs from 6 p.m. to 8 p.m. and will include wine and hors d’oeuvres served before the musical program which starts at 7 p.m.